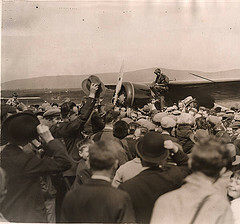 Sightseers surround the Earhart’s plane, the Lockheed Vega, shortly after landing in an Irish field just north of Derry City. May 22nd 1932. So read the article in the Monday Morning edition of the Derry Journal of May 23rd, 1932. 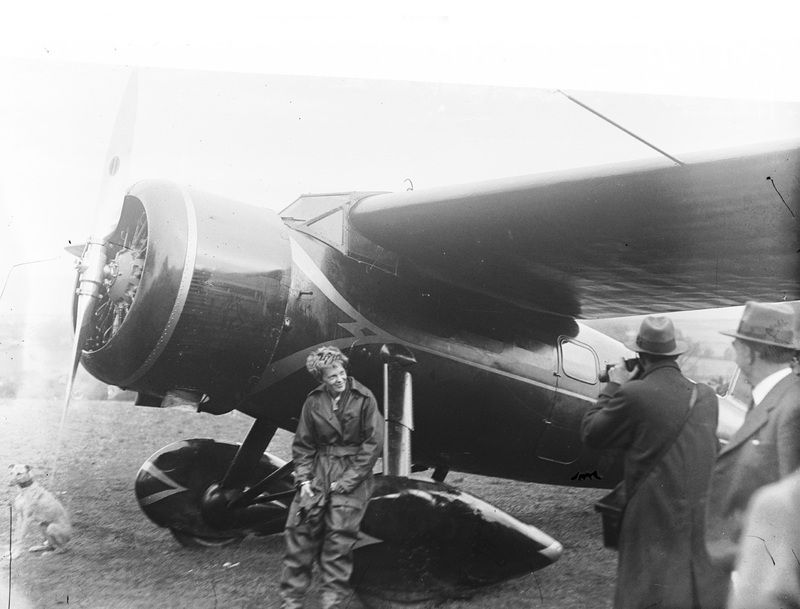 The article was written two days after one of the most significant events of the twentieth century, the first solo flight across the Atlantic by a woman covering 2026 miles in 14 hours 56 minutes. by “Lady Lindy” known to her parents as, Amelia Earhart. The Journal piece summed up the highlights of the story with no less than eight sub headings: “First woman to fly Atlantic Lands at Derry” “A Wonderful Performance” “Safe Descent Near Cottage at Springfield” “Rail track As Guide” “Three Records Established” “Gasoline Leakage Forces landing” “Great Crowds Visit Scene” Thirty-two words to sum up what was in reality a minor miracle, a miracle that both the aircraft and its soft spoken, Kansas born pilot had made it at all. But, made it she had. 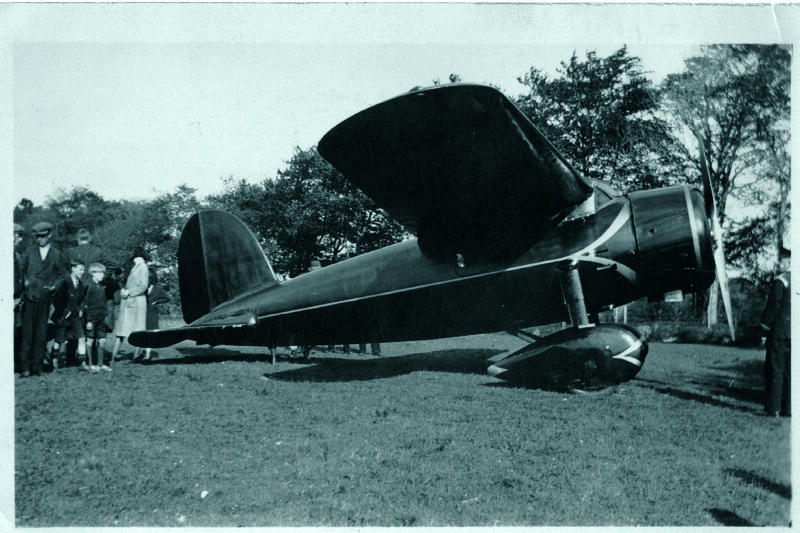 Earhart’s Lockheed Vega on the landing site at Gallagher’s Field, May 22nd, 1932. 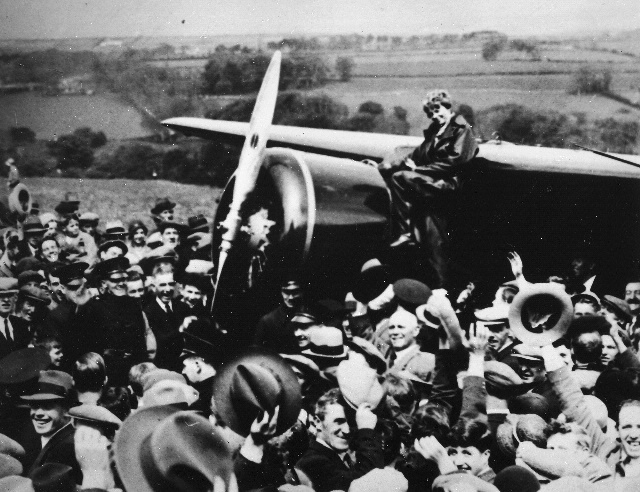 May 21, 1932, Amelia Earhart created aviation history as the first woman to fly solo across the Atlantic. 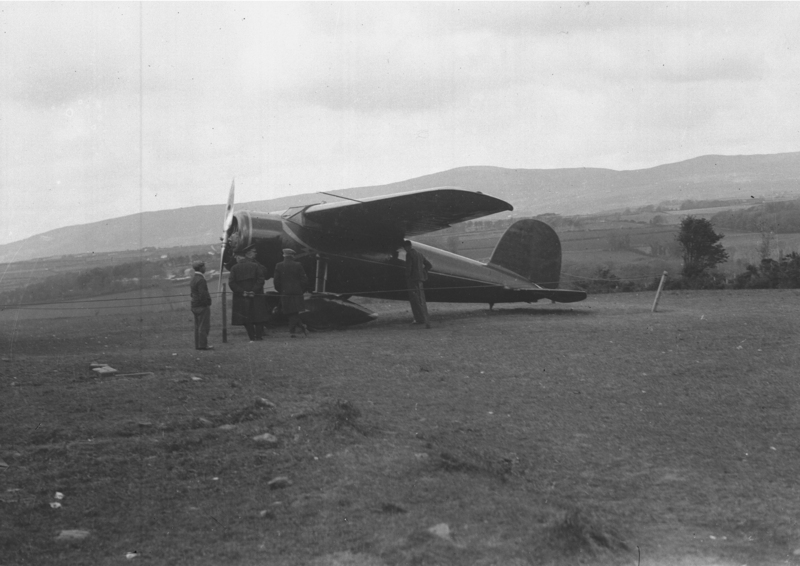 Landing just outside Derry in “Cornshell” where the Amelia Earhart Centre now stands. Local men, James McGeady and Dan McCallion were mending fences in fields close to their home at Shantallow. 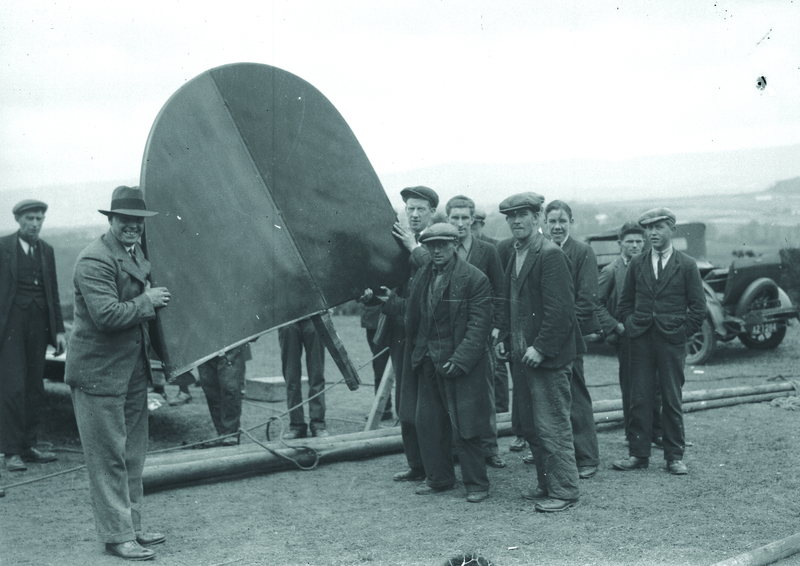 They became aware of a small red plane, an uncommon sight in those days, coming from the Moville direction. The plane began to circle. Suddenly the plane descended, so low that it clipped the hedgerow. The pilot regained control, circled McGeady’s house three times and landed uphill in the field not ten yards from where James and Dan were fencing, coming to a halt in front of two cottages owned by the McCallion and McLaughlin families. 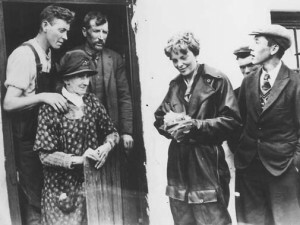 Amelia Earhart pictured outside the McLaughlin’s cottage. 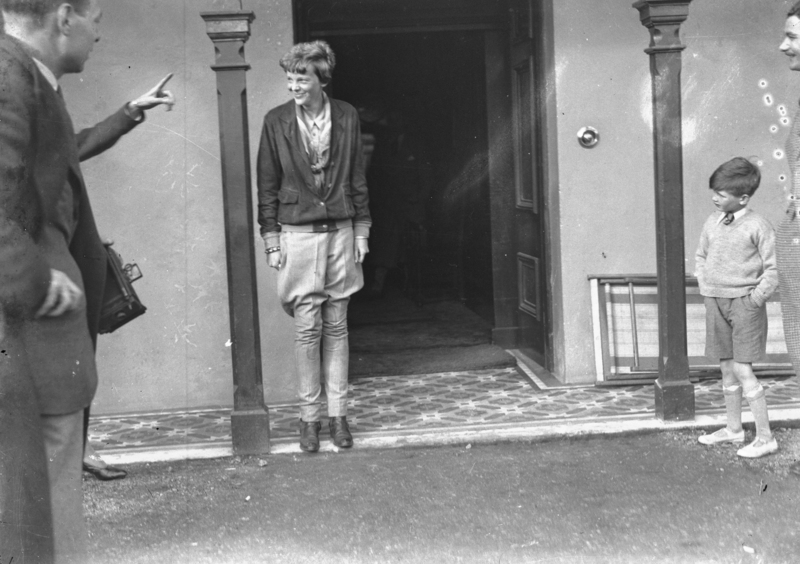 Earhart’s own accounts although modest, still paint a picture of lucky escape and near disaster. “I took off from the famous Harbour Grace runway (Newfoundland) at dusk, about 7:30pm I believe. I flew for a couple of hours while sunset lasted and then 2 more hours as the moon came up over a bank of clouds. I had fair weather for about 4 hours. Then, I ran into a storm which was one of the most severe I have ever been in. “It was one of those lovely hot afternoons that you sometimes get in May and being a Saturday and the children not at school; we were sitting in the garden. Our place is at Culmore about 2 miles from Derry. We’ve a number of big fields around the house. Well, about 2-o-clock we heard an aeroplane and soon afterwards we saw a great red monoplane over the house, flying very low. It circled round a couple of times and then made for the big field at the back of the house and landed. “The afternoon was hot and I felt lazy, so, I’m afraid I didn’t pay much attention to it. I was too comfortable where I was. The children were very excited however. So they and my husband went over to the field as did some of the farmhands and workers from other houses round about. The first farmhand that went to the aeroplane saw that there was a woman in it and asked her where she’d come from? She said, “America”. I didn’t know about this until afterwards when my curiosity got the better of me. After a minute or two I went up to the plane as well. Standing beside it was a tousle-headed girl in trousers and a leather coat. She didn’t seem at all excited. The first thing she asked me for, after we had bidden her welcome, was a telephone. She would not wait to talk but went off with my husband as fast as she could over the fields to the nearest house on the land. She explained as she went that the only thing she wanted was to get through to her husband (George Putnam) and tell him she’d arrived safely. “There was no use in waiting, so I went back to the house. I suspected she’d be very hungry. So, I got a meal ready for her. She said she hadn’t had anything but tomato juice since she’d left America. We asked her to stay with us until she was ready to go on again and she said she would, so long as we didn’t mind her clothes. She had nothing but what she stood up in. in fact, she had literally no luggage of any kind with her whatever and no money either. But my husband was able to fix that. I lent her some nice things and life was just settling down again when the trouble really started. The Gallaghers played host to Amelia all that Saturday and through to the next day, Sunday. As stated in the Mrs Gallagher interview, the moment she had landed, Amelia was anxious to find a telephone to let her husband, the newspaper magnate, George Putnam (who Amelia had married a year earlier) know that she was safe and that she had succeeded in her endeavour. 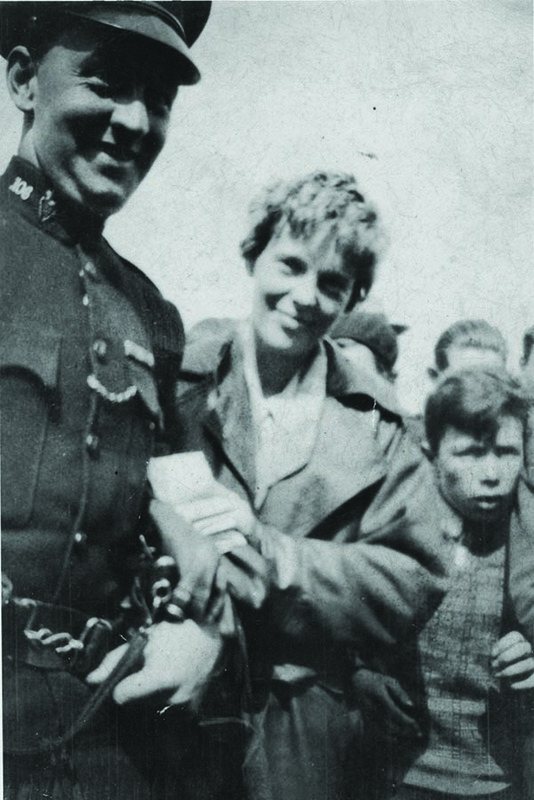 As Mary S. Lovell records in her biography, Amelia’s arrival had already been reported to the local police who in turn informed the Londonderry Sentinel, a local paper. “Landed in pasture…Londonderry, Ireland…5 miles from Londonderry…plane OK…8:35am Ireland.” Putnam’s relief was obvious. He immediately asked that she be located so he could contact her personally. Meanwhile back in Derry, Amelia was anxious to make the call. Immediately after the landing she had been invited to the Gallagher home where refreshments had already been prepared and where, according to the Derry Journal, she “cheerfully swallowed two cups of Tea and asked to use the Gallagher’s telephone. As it turned out the Gallagher’s phone lines were not up to the task. Amelia then asked where she could find a post office. Robert Gallagher immediately offered to motor her to the main post office which was located, about three miles away in the centre of the city. 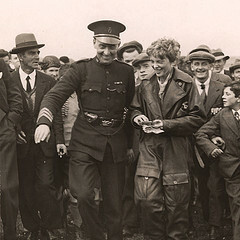 Cecil King, a journalist, was also present and he too agreed to accompany them to the post office. 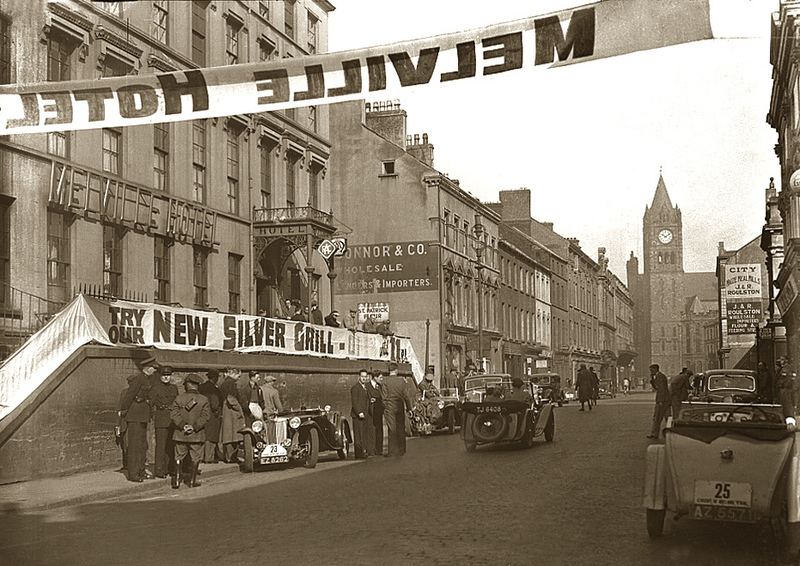 Foyle Street, Derry circa 1930s. King notes that although she an exclusive contract with the Associated Press of America on arrival at the post office ( still located in Guildhall Street beside the former Northern-Counties Hotel) Amelia booked a transatlantic call to her husband in New York and sent cables before telephoning a London number to give the story of her flight. The operator put her through to the Associated Press in London where she gave a first-hand account of her flight to the awaiting press. While she waited other calls began to pour in from across the world. She was able to tell him a little about her flight: she had chosen for the last hours to fly low over the ocean, she said, because “I’d rather drown than burn.” The call lasted fifteen minutes before those outside heard a bright “cheerio”. “Massachusetts is proud of you.” Viscount Craigavon called to offer the hospitality of Stormont Castle. Lord Londonderry, the Air Minister offered his congratulations and the American women of London offered to accommodate her the next day. Three cheers for Miss Earhart! Morrison offered to fly her from Derry to Glasgow. But, Amelia had already arranged to fly on to London the next day with the Paramount Sound Company. 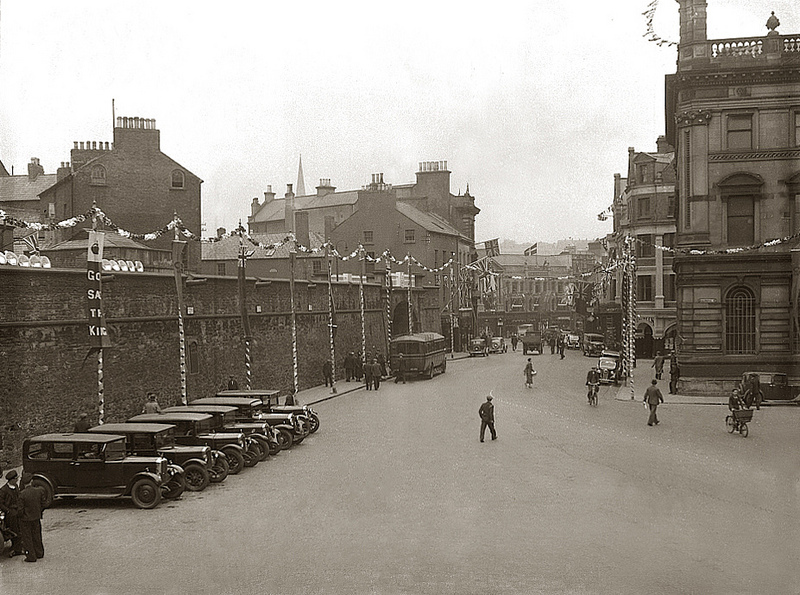 Guildhall Place circa 1932 with old city walls and Northern Counties Hotel just visible behind front building. After returning to the Gallagher’s house, Amelia retired for the night at eleven. After just seven hours sleep she rose at 6:00am on Sunday morning and was instantly greeted by hundreds more sightseers and media. The field at Springfield had by now become a temporary airfield with no less than five aeroplanes parked in the field behind Gallagher’s house. Amelia had planned to fly the Vega on to Croydon. But, after a mechanics report from Pratt Whitney she decided against further flight for the Vega and opted to have the plane dismantled and shipped back to the States. At 9:00am a plane from the National Flying Services by Paramount Newsmen, (Movietone in England) who had exclusive rights for any news reel film arrived to take Amelia on to London. Breakfast was followed by photo calls and press interviews. She posed on the plane in front of sightseers and onlookers. photos taken at the time show backdrops of rousing cheers and smiling crowds. Amelia had donned her leather flying suit for the cameras and newsreels. “ There was great excitement and a real sense of expectation among the crowds. one has to remember that, in the 1930s, a car was a rare sight never mind an aircraft. 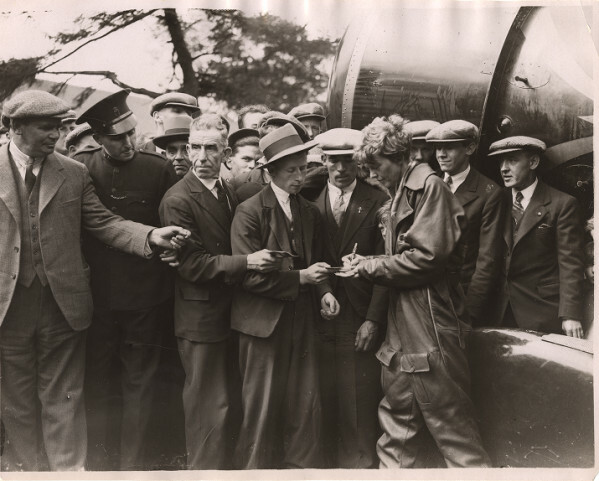 King had also been asked by Amelia to witness the removal of the plane’s barograph, the instrument that measured atmospheric pressure on flights. He was doubly honoured to take charge of the barograph to have it returned to the aeronautical headquarters in New York as proof of the flight’s duration.He had also found a copy of a Newfoundland paper, the New Brunswick Telegraph Journal of the previous day’s date, May 20th. The paper contained an account of the lead-up to the historic flight. King immediately contacted the paper and sold them the story from the Derry end. they splashed the story in their next edition. 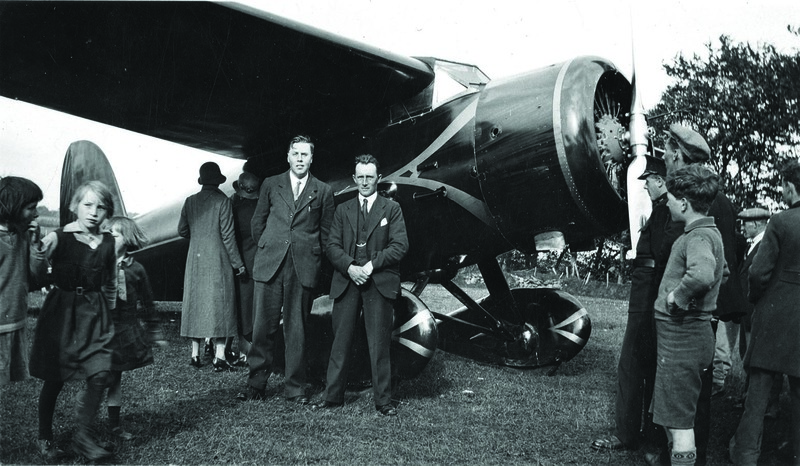 In the early afternoon of Sunday, May 22nd, 1932, Amelia took her leave of the Gallagher family and departed for London in a Desoutter aeroplane which weighed less than the entire fuel load of the Vega. She reached London in a few hours. She made a stop at Blackpool on the way where she changed planes proceeding on to Hanworth Aerodrome landing at ten past six in the evening. She arrived at Hanworth to a downpour of rain with thunder and lightening. The American ambassador, Mr. Mellon was there to greet her. Dismantling of Lockheed Vega May 1932. Reproduced courtesy of Central Library, Derry. 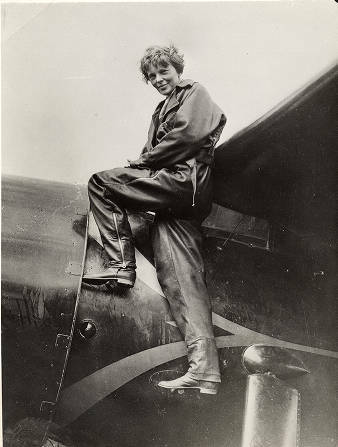 By flying solo, non-stop across the Atlantic on the night of May 20th / 21st 1932, Amelia Earhart had made aviation history.Not only had she become the first woman to cross the Atlantic alone by air she established two other records: the longest non-stop flight by a woman, 2026 miles and the most rapid Atlantic crossing; 14 hours and 56 minutes. in France she received the Cross of the legion of Honour. She also received honours from Italy and Belgium. Upon her return to the United States Amelia was honoured as no other woman had been. 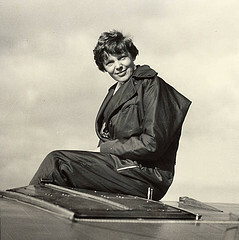 the National Geographic Society awarded her a gold medal at the White House, for contributions to aviation and science. In front of a joint meeting of the House of Representatives and the Senate she became the first woman in history to be awarded the Distinguished Flying Cross presented by Vice-President, Charles Curtis governor of her home state of Kansas.